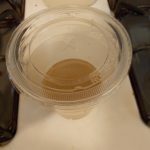 This is the third kit that many of you received at the May 2013 meeting and consists of a plastic cup filled with sand and a small bag with Agrocybe arvalis sclerotia. A sclerotium (plural sclerotia, from Greek skleros – hard) is a compact mass of hardened fungal mycelium containing food reserves. 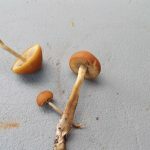 Please note that Agrocybe arvalis are not edible. Please do not eat these mushrooms! The fruiting chamber is a 12 ounce plastic cup with a lid that has holes in the bottom for drainage. 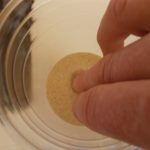 Melt a hole or two with a hot nail or paper clip into the side of the plastic cup above the sand level to add more ventilation to the fruiting chamber. 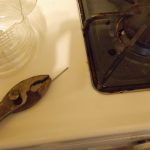 When heating the nail or paper clip, hold it with a pair of pliers to prevent burns. Or use a paper punch to punch a few holes into the side of the plastic cup. 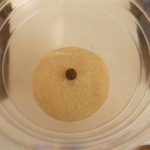 Put the sclerotia (small round pebble looking object) on top of the sand and then press it into the sand to just cover it. Pour some water into the sand, enough to cover and let it drain. You can put a saucer or something under the cup to catch what water drains. Put the lid on the cup and put it somewhere in the shade and wait for the mushrooms to form, this could take a month. 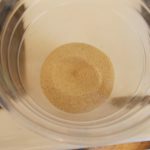 If the sand looks like it’s drying out add water. Use a hot nail or paperclip to poke holes in the plastic cup. Make sure the sclerotium is covered but not too deep. Water the newly planted sclerotium. And cover it with the lid. Leave in a shady spot. 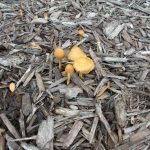 Agrocybe arvalis growing locally on mulch. 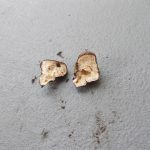 Agrocybe arvalis sclerotium cut in half. 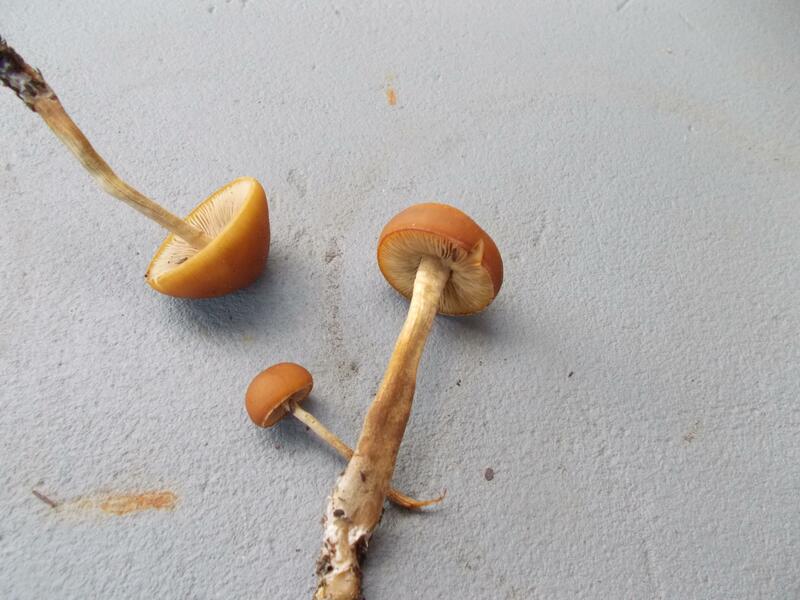 You can also purchase Agrocybe arvalis sclerotia from the store at David Fischers AmericanMushrooms site. They are right at the bottom, listed as Magic mushroom beans. The WPMC would like to thank Jim Tunney for preparing this mushroom kit. 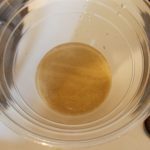 Hi, I didn’t get this kit to fruit but Katie Callihan did, and after showing me the pictures she sent them to me to share, I’ve added them to this link, http://sdrv.ms/19YcCcC with the pictures used for the fruiting instructions. Katie’s kit fruited in September, which is around the time that I found the mushroom I cloned for the kit, and they fruited again this year about the same time. Thank you Katie, for the pictures and the patience and attention to get this to fruit.